The Wayne State University College of Engineering hosted two notable events on April 21, including the third annual Student Design and Innovation Day, which showcased nearly 70 unique student projects covering a wide range of applications and engineering disciplines. Sponsored by the James and Patricia Anderson Engineering Ventures Institute, Student Design and Innovation Day demonstrates students’ solutions to engineering challenges as well as commercial and social needs. The event offers up to $1,000 in cash prizes to the best projects, and reflects the mission of the Anderson Institute to foster entrepreneurism through investment in marketable technologies. 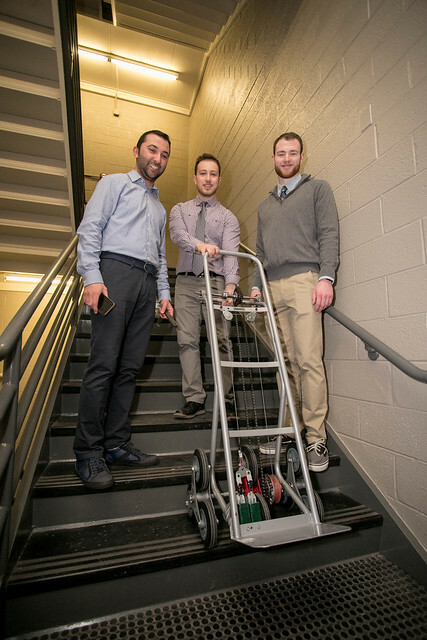 Taking first place honors was a five-member team of mechanical engineering students — Andrew Abdulnour, Charlie Wilson, Fawaz Yono, Ghadi Kanso, and Omar Alzuhd — that designed a stair-climbing, three-wheeled hand truck intended to ease the burden of transporting heavy or bulky objects, a simple but common problem. "It was really rewarding to be able to put all the engineering knowledge that we had gained in the past few years to work,” said Abdulnour. “Seeing the project come to life in a matter of a few weeks was really cool but the process wasn't without a few setbacks. By the end we felt like we gained a lot from the whole experience." Other top projects included an Internet of Things sensor package for environmental sampling, a self-cleaning vehicle camera housing, and a portable audio software application for aspiring musicians. Student Design and Innovation Day was preceded by the inaugural WSU HealthConnect Symposium, which presented an overview of trends in wireless health tools development including sensor technologies and their applications. This event also featured a design contest, with biomedical engineering graduate student Afreen Fatima taking top honors for her design of a wearable brain imaging cap. A three-wheeled hand truck which would allow an operator to climb stairs while transporting boxes and other bulky or heavy objects easily, smoothly and safely. Users can test environmental criteria using IoT sensors, an option which is less expensive, low weight, easy to use, and capable of transmitting data from anywhere to a cloud-based platform. A modulation application which can be loaded onto a small, affordable computer (i.e. Raspberry Pi) to replace expensive hardware modulation effects pedals, making musicianship more widely accessible. A self-cleaning camera housing for various automotive applications including backup cameras and autonomous vehicle systems. A wearable cap with embedded sensors that can perform functional brain imaging and transmit data in real time to a mobile/PC unit.